Picture windows are the perfect choice to replace old picture windows or to bring new light into any room. Picture windows can be combined with all windows to create your own special architectural effect. Picture windows come in two distinct profiles, the HIGH PROFILE matches glass site-lines with other windows and and whrn using Casement or Awing windows give the exterior appearance of the operating window. The LOW PROFILE windows has less PVC exposed and ois designed to give maximum glass area. Picture windows are also available in an unlimited number of architectural and curved shapes. Internal grills may be added to create a distinctive or historical look. Each shape is custom manufactured to your specifications. 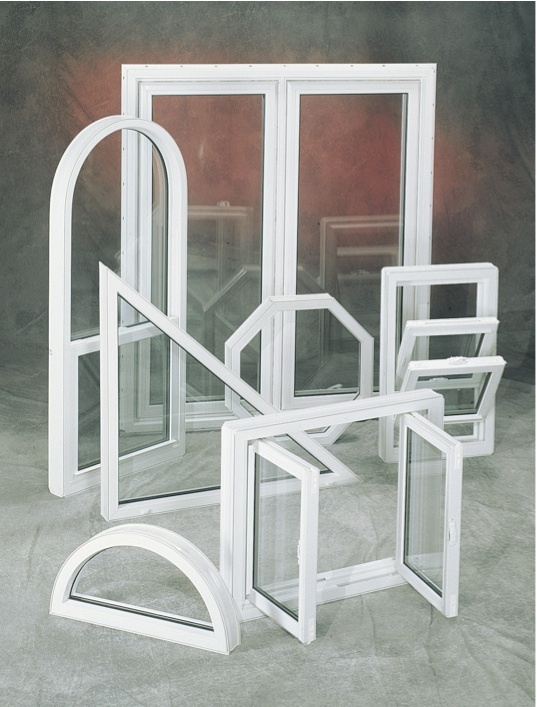 Picture windows are made with specially designed PVC profiles that will support large glazed areas under all conditions. All Picture windows are "wet glazed" to prevent water penetration and interior slotted drainage holes allow for pressure equalization and positive drainage of winter condensation along the glass edge. All ORAN windows are glazed with High Performance, Energy-Efficient, LOW 'E' glass. LOW 'E' glass is a high performance glass made with an invisible clear coating that controls heat flow. This invisible coating separates heat from cold. In winter the heat stays inside your home, where you need it to keep warm. In summer the heat stays outside, reducing cooling costs. LOW'E' glass also acts as a UV filter to protect your interior drapes, upholstery and carpet from early fading. The final component for the ultimate in insulating glass efficiency. Warm Edge spacers provide a THERMAL BREAK between the outside and inside panes of glass. The warmer edge of the insulating glass unit will greatly reduce the possibility of condensation and in some cases ice forming on the inside surface of the insulating glass units edges. Condensation is a result of inside humidity levels and outside temperatures. Please consult your dealer for more information and government published charts. Most Oran windows are available in other colours than white. Current solid colours are white and cream. CAP-STOCK, a system whereby a coloured PVC is applied to the EXTERIOR of the window profile at the time of extrusion is also available on most window systems. The current CAP-STOCK colours extruded on white profiles only are Cream, Sandalwood and Chestnut Brown. New technology in paint systems and PVC compounding has given Oran the ability to match nearly any color for the EXTERIOR of most window systems. Almost any colour can be applied to the exterior of a window and range from Greys, Greens and Blues to exotic colours such as Red, Pink and Yellow. Since colour descriptions are not always accurate and our perception of colours vary from individual to individual it is recommended that you visit you Oran dealer and look at the actual colour samples before ordering solid colours, CAP-STOCK or painted windows. All Oran windows may be ordered with interior grills in either a colonial pattern or a diamond pattern. grills are available in a number of materials, colors and styles and their suitability for use in windows is usually dependent on the type of Insulating Glass Unit used. The information below is a condensed chart on grill suitability with Insulating Glass Units. Your dealer will have more specific information on each category.